Is the tragic Pulwama attack in Kashmir a surprise? Are Modi's policies of relying on force alone contributing to rising violence in Kashmir and across India? Is blaming Pakistan just a distraction from the core issues in India? Why has India seen the world's highest number of bomb blasts, more than in Iraq, Syria, and Afghanistan in the last two years? 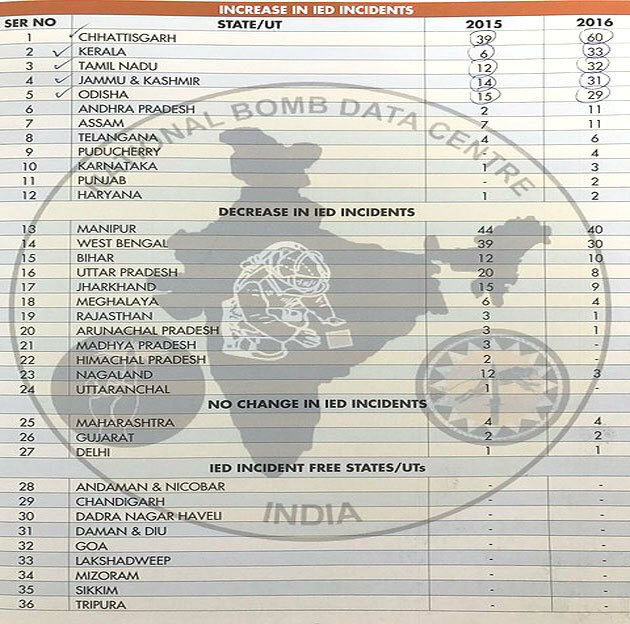 And why does Chattisgarh top the list of places with the highest number of bomb blasts followed by Manipur, Kerala, Tamil Nadu, and Indian-occupied Kashmir? Does the Modi policy of crushing Maoists and Kashmiri resistance make any sense? Can India tackle these issues by force alone without a parallel political strategy and peace process? Is it a mistake for Washington and Moscow to ignore President Ghani and his government in reaching peace deals with the Taliban? Should Islamabad try and bring the Ghani government reps into the process for lasting peace? Does the Ghani government really matter any more on the ground where it lacks credibility? What is the best long term arrangement to stabilize Afghanistan? Would it take a regional deal involving all of its neighbors as well as the US, China, Russia, and India? Is there a link between Pakistan's help in US-Taliban talks and the willingness of Gulf Arabs and IMF to aid Pakistan in resolving its balance of payment crisis? Is ex-State Department official Vali Nasr right when he says: “Any Afghan settlement needs #Pakistan. Pakistan is playing ball with the US and that means Pakistan is in a position to make demands as well.”? Is Saudi Prince Mohammad Bin Salman's visit to Pakistan a part of this larger picture? India-Pakistan Nuclear Standoff: What Does the West Have At Stake? Iran and Russia Supporting Afghan Taliban? What is India Hiding From UN Human Rights Team? PDP president Mehbooba Mufti Monday expressed condolences to the families of soldiers killed in the Pulwama encounter, saying the bloodshed will only stop when the Centre overhauls its approach to Jammu and Kashmir. "Deepest condolences to the families. This bloodshed will only stop when GoI (Government of India) overhauls its approach (rather lack of it) towards J&K," the former Jammu and Kashmir chief minister said in a tweet. She expressed the need to "stop the obsession with Pakistan" and "set our own house in order". "Lets drop the obsession with Pakistan and get our own house in order. The current attitude will only worsen the situation & polarise the nation (sic)," she added. Two Jaish terrorists, including a Pakistani commander of the group being investigated for his role in the February 14 CRPF bombing, and an Army major were among the seven people killed in an encounter in Jammu and Kashmir's Pulwama district on Monday, officials said. At least six security personnel, including a Brigadier, a lieutenant colonel and a deputy inspector general, were injured in the gun battle in Pulwama's Pinglan area, about 12 km from where a suicide bomber belonging to the Jaish-e-Mohammed drove his explosives-laden vehicle into a CRPF bus last week, killing 40 jawans. India blames Pakistan for Thursday’s suicide bombing in Pulwama that killed over 40 soldiers in India-held Kashmir. Pakistan has strongly rejected the Indian claim, urging New Delhi to avoid such “sad and baseless knee-jerk reactions”. The Indian media reported that the suicide car-bomber Aadil Ahmad Dar used more than 750 pounds of explosives against the military convoy he targeted. Gen Hooda, who commanded the Indian army’s Northern Command during a similar crisis in September 2016, told The New York Times on Saturday that “the material may have been taken from stashes of explosives” being used to broaden the Jammu highway where the attack occurred. The newspaper also noted that India’s options for putting diplomatic pressure on Pakistan were limited, so were its options for a military response. “Pakistan is largely shielded by its alliance with China, which has used its veto power at the United Nations Security Council to protect it,” said the NYT report while explaining why India did not have too many options for diplomatically isolating Pakistan. “India’s options for a military response are also limited, analysts say, with the disputed border blanketed in thick snow and Pakistani troops on high alert,” the report added. Diplomatic observers in Washington pointed out that the United States will also not like to isolate Pakistan, particularly now when it’s playing a key role in US-Taliban talks. A semi-official US media outlet, Voice of America, reported that American and Taliban officials are set to meet in Islamabad on Monday for a new round of direct peace negotiations aimed at paving the way for a political settlement to the war in Afghanistan. The NYT report also hinted that the bomber might have been motivated by domestic reasons to carry out the attack. “The nature of Thursday’s bombing suggests the insurgency is adapting and becoming more homegrown, leaving observers to question how deep the links to Pakistan really run,” the newspaper observed. It pointed out that Dar was from a village about six miles from where the Indian convoy was struck ... and the explosives he packed into his car appear to have been locally procured. The report noted that “an insurgency that was once stoked by Pakistan may have taken on a life of its own, as Kashmiris become more disenfranchised and angry at the central government in Delhi and its use of force”. Some of Dar’s friends told NYT that he turned to militancy after he was wounded at a protest in 2016, where his leg was struck by a bullet fired by the Central Reserve Police Force, a paramilitary unit. “Many Kashmiris loathe the paramilitary unit, viewing it as an occupying force recruited from across India to suppress them,” the report added. It also noted that the attack had “prompted new questions about how tenable (Prime Minister Narendra) Modi’s hard-line strategy” in Kashmir was. India has about 250,000 armed forces in Kashmir, making it one of the most militarised corners of the world. “The armed presence affects everyday life for most locals, whose farmland, homes or schools are overshadowed by the military presence,” NYT added. Yet, a former White House adviser on South Asian affairs, Joshua White, warned that India could pursue “a limited military action, more useful for catharsis than deterrence”. “The sad reality is that until and unless Pakistan itself makes a decision to stop harbouring groups like Jaish-e-Mohammad, there is little that India or the United States can do to diminish the threat of these devastating attacks,” he said. Andhra Pradesh Chief Minister Chandrababu Naidu was commenting on Pakistan Prime Minister Imran Khan's statement on the terrorist attack in Pulwama, which he delivered in a televised address on Tuesday. Chandrababu Naidu blames the BJP's "inefficiency" for what he describes as a threat to national security in the wake of Pakistan's reaction to criticism for last week's terrorist attack in Pulwama. In comments published by ANI, the chief minister of Andhra Pradesh accused BJP leaders of "belittling" India with their "petty" actions and "wrongdoing". He said he would not tolerate what he described as the "jeopardising" of national security for self-interest. On Tuesday, Pakistan Prime Minister Imran Khan defended his country from blame for the Pulwama attack, carried out by the terrorist group Jaish-e-Mohammed, in which 40 Indian paramilitary soldiers were martyred. In a televised address, he threatened to retaliate if India attacked Pakistan. Chandrababu Naidu, who leads former NDA ally Telugu Desam Party (TDP), said there were "many apprehensions" over Imran Khan's statement. He said tough action should be taken on terrorist attacks. Andhra Pradesh CM Chandrababu Naidu: Will not tolerate jeopardizing National security for self-interests. Will not tolerate playing with Army for political gains. Tough action should be taken on terror attacks. Andhra Pradesh CM Chandrababu Naidu on Pakistan PM's statement on #PulwamaAttack: Many apprehensions over his statement. Threat to national security because of the inefficiency of the ruling party. BJP leaders are belittling the nation with their petty actions and wrongdoings. India has killed three terrorists in Kashmir in the wake of the attack in Pulwama, including the man who masterminded it. It has said the presence of Jaish-e-Mohammed and its leader, Masood Azhar, in Pakistan should be sufficient proof for Islamabad to take action. "The prime minister of Pakistan has offered to investigate the matter if India provides proof. This is a lame excuse," the Ministry of External Affairs said on Tuesday. "In the horrific attack in Mumbai on 26/11, proof was provided to Pakistan. Despite this, the case has not progressed for the last more than 10 years. Likewise, on the terror attack on the Pathankot airbase, there has been no progress." Meanwhile, the Indian Army has warned parents of Kashmiri terrorists that anyone who picks up a gun in the Valley will be killed, and urged them to ask their children to surrender. A 14 February suicide attack by Pakistan-based militants was their bloodiest strike in Indian-administered Kashmir in over three decades. In this Q&A, our Asia Program Director Laurel Miller warns that even a limited Indian retaliatory strike could spark a sharp escalation in conflict between the nuclear-armed neighbours. Was Kashmiri homegrown militancy responsible for the Pulwama attack? Rampant rights abuses amid a climate of impunity, highlighted in the June 2018 UN report on Kashmir, and draconian laws such as the Armed Services Special Powers Act serve as recruiting tools for both Kashmiri separatist groups and Pakistani jihadist outfits like Jaish-e-Mohammed. Clearing operations by Indian security forces such as “Operation All Out”, launched in mid-2017, led to 2018 becoming the bloodiest year in J&K in a decade. Around 500 people were killed in Kashmir’s conflict-related violence, including militants, civilians and security personnel. Although more than half of those killed were militants, many non-combatants were also killed, injured or disappeared in military operations, resulting in more support by local communities for the militant cause.